It sounded interesting and a book reviewer I follow said good things about it. All the characters are very human, despite all of them being in very dehumanizing circumstances. I was able to understand the motivation behind each character’s actions even when the actions were terrible. The pacing was great as well. I devoured this book very quickly because I had to know what happened next. An urge to read the next book, which comes out on August 30th. It feels too far away! Also, I enjoyed that the book managed to stay hopeful even through the oppressive atmosphere of the assassin school. Anyone who likes fantasy books with good world building and a nice blend of action, political, and interpersonal plots. Fans of The Hunger Games in particular. The assassin training school reminded me of the academy in F.M. Busby’s Star Rebel. They are both comprehensively brutal. I would pair this book with its sequel. Because I need it. Right now. Get in my eyeballs! 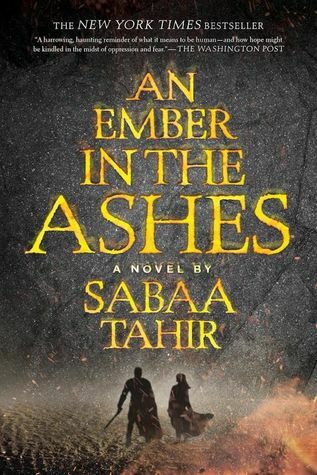 Interested in reading An Ember in the Ashes for yourself? Check it out from the library! Want to read A Torch Against the Night, the second book in the series that will be coming out August 30th? Use the book request form to ask the Durham Tech Library to buy it. Whether you’ve stubbornly decided to deny that you know what a Pikachu is, have whole-heartedly embraced that you’re committed to powering up your Snorlax, or are anywhere in between, Pokémon GO is here… and accessible for smartphone gamers of all skill levels. There are lots of options of places to battle or gather supplies (and catch ’em all!) around Durham Tech. Did you know the Main Campus Library is a gym or that there are two PokéStops accessible in the Orange County Campus Library? Caught any interesting Pokémon in the library or around Durham Tech? Take a picture and email it to us at library AT durhamtech dot edu and we’ll add it to our slideshow! This book was read by Julie Humphrey, Assistant Director, Library. I really enjoy nonfiction, biographies, memoirs, and reading about women’s lives. I am also interested in photography, photojournalism, and travel. 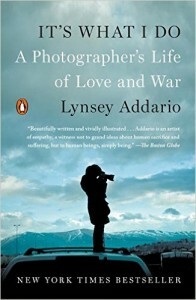 This book about a woman war photographer sounded compelling to me. I especially appreciated the author’s honesty and the vivid details she shared of living and working in conflict and war zones around the world. She has worked in Afghanistan, Iraq, Darfur, The Democratic Republic of Congo, Somalia, Libya, etc… and lived in Istanbul and London. I was really glad the book included many of her photographs. These striking, award-winning photos really enhanced her story and brought it to life. I also liked learning about the logistics of this work and what happens behind the scenes with support staff like local drivers and translators. I have a new appreciation for everything and everyone involved in international reporting. Addario deals with sexism so often while working in the heavily male-dominated profession of war photojournalism. I felt really frustrated for her in many situations and admired her fight to be taken seriously. I also felt extremely afraid and disturbed when she shares her accounts of being kidnapped, assaulted, and abused while working. I ultimately feel a deep appreciation for the work of journalists around the world who risk their lives every day in order to document and tell important stories. Readers who like a gripping and intense personal story. I would also recommend this to anyone interested in world politics and international conflicts. This is a must-read for aspiring journalists and photographers. Fresh, cold water! She describes being severely dehydrated on some of her work assignments. Also, a bottle of cold beer, which she describes having from time to time, in order to unwind with her fellow journalists after an intense or grueling day of work. Interested in reading It’s What I Do? Check it out from the library! A hearty welcome to all new and returning faculty, staff, and students! We have some great new materials for you to check out! This spring the Modern Language Association of America (MLA) replaced its seventh edition handbook with a new eighth edition. The new edition includes significant changes that focus more on the process of writing and documenting sources. 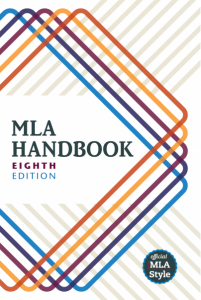 Previous editions of the handbook provided very specific guidelines for formatting and citing and the new eighth edition outlines basic core elements and principles of MLA documentation and explains how writers can use them in different situations. Explore the MLA Style Center website for frequently asked questions and answers, teaching resources, tips on formatting a research paper, and information on plagiarism and dishonesty. Librarian Meredith Lewis is currently revising the Durham Tech Library’s MLA guide. We’ll let you know when it is available. 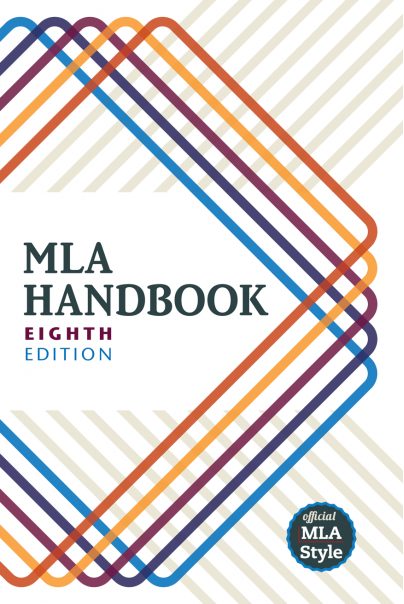 Print copies of the MLA Handbook 8th edition are available at all three campus libraries.